The Lexmark E323n laser printer is a powerful, compact, desktop solution that is easy to use and provides exceptional performance. Its Ethernet or USB support facilitates reliable connections to users’ computers or network. The Expandable memory options, PCL datastreams and Standard PostScript enable the flexibility to print from a range of applications. 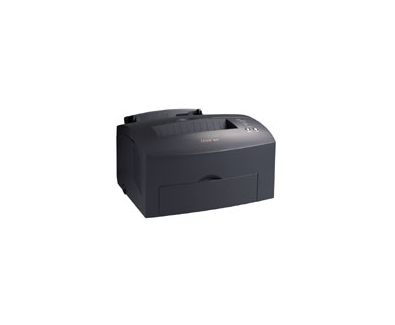 The Lexmark E323n is a small, space-saving printer designed specifically for areas with limited space. Its dimensions are 8.7 x 15.4 x 14.2 inches (height x width x depth), and it weighs 19.85lbs. Its paper input capacity ranges from 150 pages to 400 pages, and its paper output capacity is 100 pages. The standard paper handling encompasses a 150-sheet input tray, with a single-sheet manual feed and a 100-sheet output bin, plus there is an optional 250-sheet drawer. With a black print resolution of 300 x 300 dpi, 600 x 600 dpi, 1200 Image Quality, it supports a variety of media types, including plain paper, transparencies, paper labels, car stock and envelopes. Its printer languages include Standard, PCL 6 Emulation, Personal Printer Data Stream (PPDS) and PostScript 3 Emulation. With speeds of 20 pages per minute for letters and 19 pages per minute for A4 printing providing excellent output. There is a fast 9.5-second time to first print, meaning that small jobs are produced speedily, and the powerful 200 MHz processor combined with the 16MB memory prints complex jobs quickly. The job cancel button on the operator panel saves time, as does the high-yield print cartridge, which is simple to install. The Lexmark E323n laser printer is a good compact option for businesses with a limited amount of space, but it is limited to monochrome printing only. Laser printers are not always the cheapest option, given the high cost of toner for laser printers.